Our essiac wholesale program is very popular worldwide. It's a great time to be interested in essiac resale! It's definitely possible to offer quality essiac at below-market-price and still make a healthy profit--IF you choose the right supplier. 2. You can purchase Retail-Ready Packages of Essiac from us at a low cost and resell it at a fair price, but still at a profit for you. We see people selling essiac for as much as $89.54 per 4 oz. of herbs in health food stores. The average retail price for 4 oz. 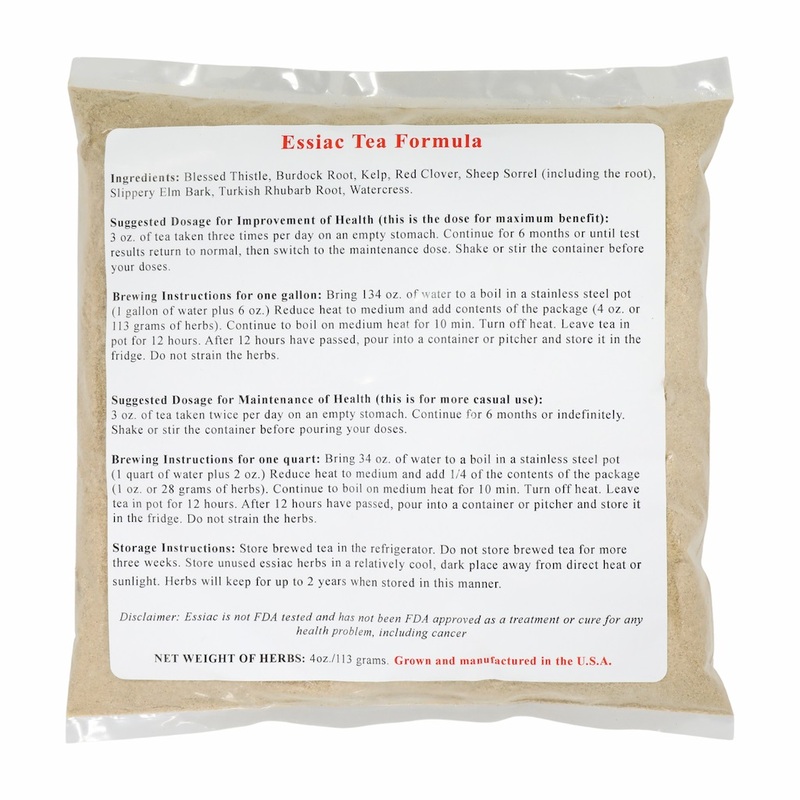 of essiac herbs is generally in the range of $20-40. 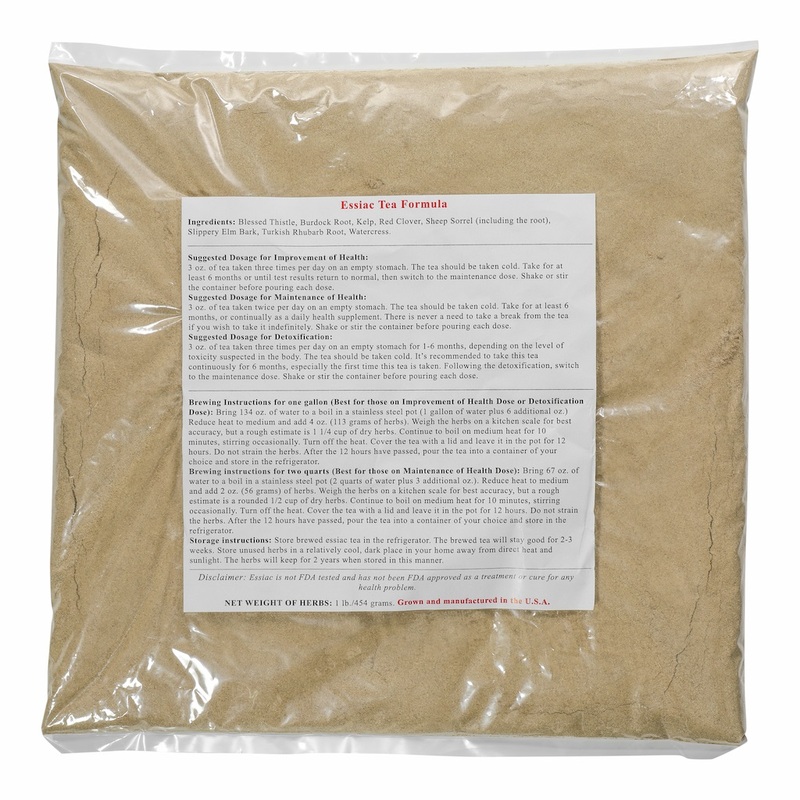 If you decide to purchase bulk essiac wholesale from us and use your own packaging, you can get 4 oz. of essiac for $4.94 (and this is the amount we have seen selling as high as $89.54, and even higher for bottled essiac!) Because you can obtain the herbs for such a low price, you are free to market high-end and try to make a higher profit, or market lower-end to offer your customers a good discount. After paying someone to package it (or packaging it yourself) you'll still come out with a HEFTY profit. Alternately, you can purchase specific essiac packets and bags wholesale from us all ready to go and STILL resell them for a good profit. (minimum order of $300.00 at a time. You may be exempt from this minimum on your first purchase at our discretion). Essiac Wholesale Pricing for Resellers, Clinicians, Herbalists, Distributors, and Health Food Stores. Bulk essiac by the lb. Your cost: $17.95/lb. when purchasing a 50-lb. minimum, Suggested Retail: $69.95/lb* Please call 1-866-ESSIAC1 (1-866-377-4221) to order bulk essiac at this special price. Check out these Wholesale Prices for Packaged Essiac. If you would like to purchase a high volume or go under contract with us for automatic shipments, we might be able to lower the price for you. Call us Toll-Free 1-866-ESSIAC1 (1-866-377-4221) for quotes. Note: These Essiac Wholesale Prices are for quantities less than 50 lb. If you order more, you will enjoy even steeper discounts. Please call us at 1-978-504-9517 or email us at gina @ discount-essiac-tea.com for more information on these larger essiac wholesale quantities. Your gross sales will be at least $779.74, and your profit will be at least $589.78 (suggested resale price is $29.99 each). Your gross sales will be at least $1098.90, and your profit will be at least $879.20 (suggested resale price $109.89 each). *Our retail-ready products are "generic labeling" without our website or contact information so that your customers will return to you. You may add your company name. Full instructions are included on labels. 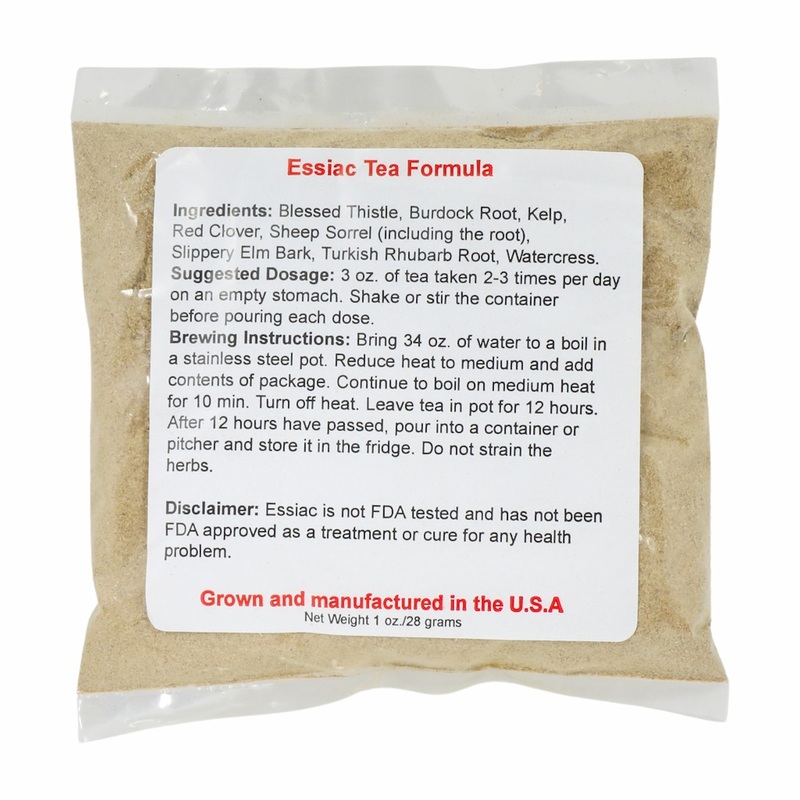 After looking at these numbers, it is easy to see why resellers can purchase essiac wholesale from discount-essiac-tea.com at the prices posted on our website and make a HEALTHY profit (even when dealing in small quantities if your business is just starting out). In fact, purchasing essiac wholesale from us might be one of the highest-profit opportunities in the herbal business! Our bulk herbs come in plain packaging, designed either for the value-conscious end user OR the reseller looking for inexpensive but high quality essiac. Customers are used to paying $20-$40 for 4 oz. of essiac herbs, so you won't have trouble selling essiac at the suggested retail prices, which are between around 4 and 5 times higher than your costs! Our retail-ready essiac comes in sealed and labeled polybags, which serve as stand-alone units (no additional instructions necessary). 1. Sizes of packaging you offer. The smaller the size you sell essiac, the higher price you can command per ounce. 2. Type of packaging you offer. The more attractive and fancy your packaging is, the higher price you can command. Attractive, high-quality packaging with special features like re-sealable packets or colorful labels, especially for 4 oz. and up sizes, can command higher prices. 3. The convenience you offer. Location, location, location! If you sell your essiac out of health food stores or practitioner's clinics, you can usually charge more than you can if you sell essiac on a website. However, selling on a website can work well also, especially if the website already has customers who buy other types of cancer supplements and cancer treatments. Customers like to bundle purchases to increase their results as well as to save on shipping. If you don't have a health food store, clinic, or website, you can become the middleman by selling essiac to people who DO. People who already have a customer base will be eager to add another product to their line that their customers are hungry for. 4. 'What else' you have to offer. If you bundle essiac with another health product or a health service, you will add value to your offerings, and perhaps gain an essiac customer out of the arrangement. If you don't have a related product or service right now, propose the idea to someone who does, and become the middleman, supplying THEM with essiac. 5. Region. Typically regions near larger cities will enable higher pricing. With our essiac wholesale program, all of this possible! Don't Want Inventory? Take a Look at our Affiliate Program. This program is an alternative way to make some money via promoting essiac without having to purchase essiac wholesale. Rather, you will receive a commission each time someone buys on our site via your link. Click here for the popular Discount Essiac Tea Affiliate Program.